You can go here: http://www.jampaper.com/Product-Samples.asp to find out how to order. Hello, The best category to look for paper that bright would be at the link I've posted below. http://www.jampaper.com/PaperCardstock/BriteHueRecycledPaperCardstock That is our Brite Hue recycled paper. Hope this helps! Your party is coming up and you want the invitation to be just as cheerful as the event itself. 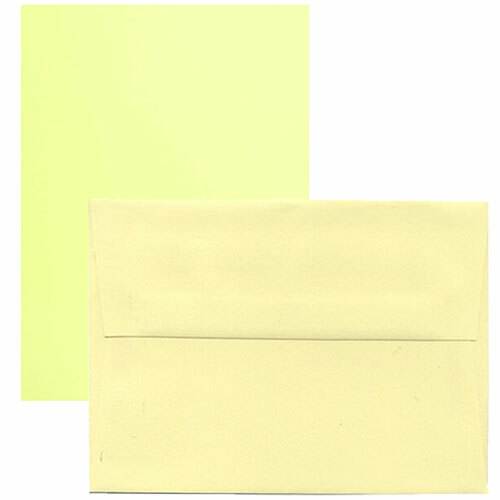 Light Yellow Envelopes have a sunny disposition that can brighten up any piece of correspondence. The mellow pastel color of these envelopes is not as striking as a lemon yellow, providing a delicate and dainty look for invitations that are simply charming. Light Yellow Envelopes give springtime weddings a glow. So even if the day doesn't wind up being sunlit, your invitation will be. You can decorate these envelopes with a complimentary shade like refreshing aqua or pretty lavender for a color combination that your recipients will love. Make your event a pretty occasion... starting with the envelope. • Note: A7 Envelopes are available by box 250 only. 8.5 x 11/8.5 x 14 Paper & Cardstock is also available in Light Yellow.